Icebreaker Games for Kids: If you ever attended summer camp as a child, then you probably know how uncomfortable that first day can be. What about the first hour of that sleepover, or the birthday party where you felt like the outcast? Think back to how cold it felt in the room because nobody was talking, and you thought about calling your parents to pick you up and take you back home. If you’re planning an event where the children are new to the group you might want to consider a way of making them feel comfortable so you will have fewer tears to deal with and more laughter in the air. There are several ways you can warm up the chill and make the kids feel welcomed right from the beginning. 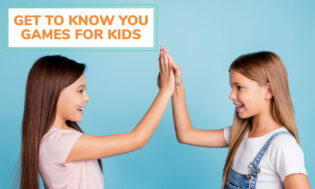 Take a look at the following 21 fun icebreaker games for kids. 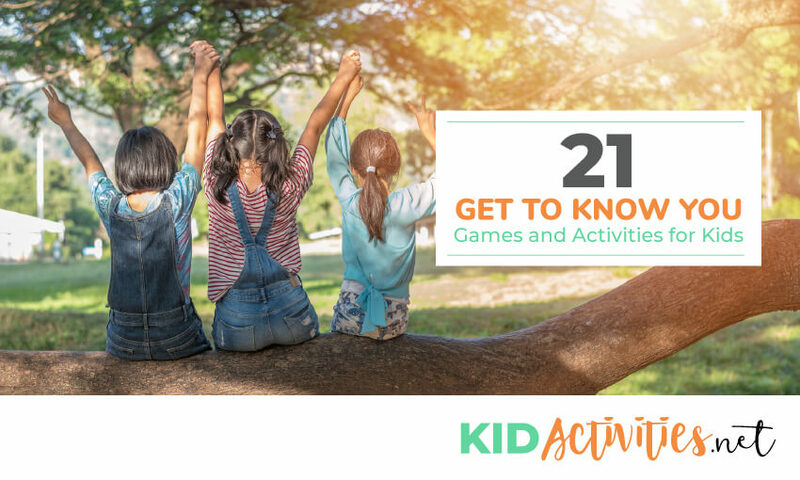 With all these games and activity ideas, you should never have any child feeling like you did when you were away from home. Set Up: Put the chairs in a circle so that they are facing the inside. Each child should sit down before the game begins. One child or adult should be selected as the caller and remain standing. How to Play: The caller should call out “A great wind blows for everyone who ______.” The blank should be filled in with such things as has red hair, has a bow in their hair, who ate cereal for breakfast, who has a younger sibling, etc. For the people who this applies to, they should stand up and change seats at least two away from where they are currently standing. This game could be played similar to Musical Chairs where one chair is removed each time and those left standing are out. The final person who has a seat wins the game. What You Will Need: A bowl filled with candy for each person to have at least 5 pieces. Set Up: When all the candy is placed in the bowl, ask each person to take 1-5 pieces, but don’t tell them what they are going to do with them. How to Play: Each person must tell something about themselves for each piece of candy they took. So, if someone takes 3 pieces, they must tell 3 things about themselves. Once everyone has had a turn, they can share the candy with their new friends. What You Will Need: This game can be purchased from Amazon and can be taken anyplace you go. 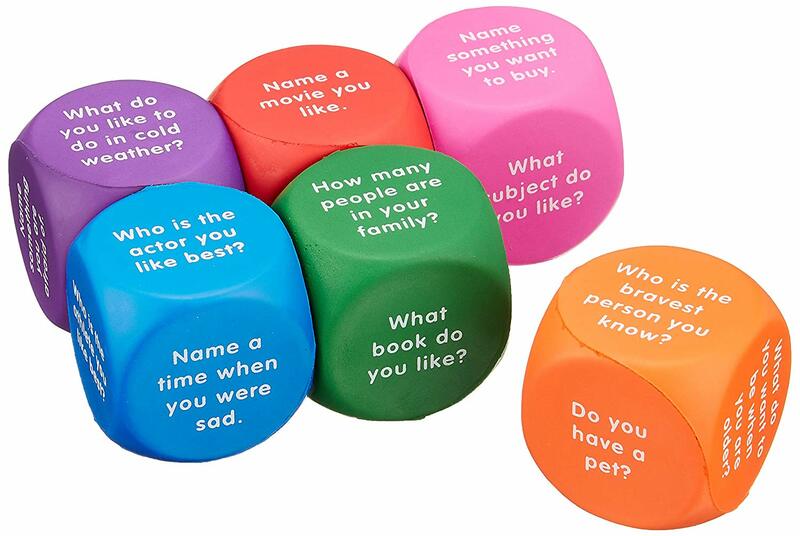 It comes with 6 soft foam colorful dice with 36 conversation starters on each one that is suitable for children between the ages of 6 and 10-years old. Set Up: You can either set the children around the table in one group or you can divide the group up into two teams. Place all 6 dice on the table in front of the group or split them up giving 3 to one team and 3 to the other. How to Play: There is an activity guide that comes with the game, but it is so versatile that it can be played in several different ways. One idea is to go around the table allowing each person to roll the cube and answer the question, or they can take turns rolling and with each roll, everyone should answer the same question. With this game, you have the flexibility to structure it according to your needs and for the group who is participating. What You Will Need: A beginning line and a finish line. Set Up: Choose teams of 4 to 10 players and form the teams in straight lines. How to Play: When the teams and lines are formed, the first person on each team will be the leader. Everyone behind the leader will place their hands on the shoulders of the person in front of them. Each team should crouch down to look like a crocodile. All the crocodiles will race to the finish line, or from the start to the finish and back to start again. The first team to finish wins. Set Up: Gather enough chairs for each person and set them up facing each other. Prepare the conversation topics ahead of time and place them in a box for the caller to hold. What You Will Need: A beach ball or a similar ball that will fit in the hands of smaller children. Set Up: Form a circle of children and adults. Here are some more get-to-know you game ideas. What You Will Need: You can purchase this fun game from Amazon. It comes with a playing board, one die, pawns, and cards. Set Up: Set up the playing board and ask each player to choose their favorite color pawn. Shuffle the cards and place them in the designated space on the board. How to Play: Each player will take a turn rolling the die and moving their pawn to the correct number of spaces on the board. When they land on a space they must follow the directions, such as burp out loud a certain amount of times or tickle the person on their left. When they land on a space that says to draw an I’ve Never card, they must answer the question on the card such as: “I’ve never flushed a dead goldfish down the toilet?” Depending on their answer will determine what they should do next. Perhaps they will get to move forward, or they will have to move back one space or two on the board. You can make the game more exciting by asking the person to elaborate on their answers. 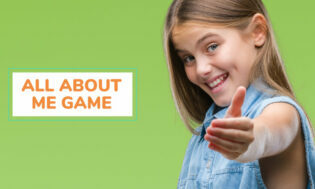 This game works great with a group of kids 8 years and older, even the teens will like this game. What You Will Need: A group of mixed aged children and adults. Set Up: Split everyone up into teams of 5 or 6 people per team. Appoint one person to be the caller. How to Play: Once the teams are ready the caller should call out instructions to the teams. The caller should always start by saying, “Everyone please line up_______” and then he/she should finish with things such as 1) “In order of your ages from oldest to the youngest.” Other suggestions could be: 2) “Everyone please line up by height with the shortest first.” 3) “Everyone please line up in alphabetical order according to your first name.” You can twist this game up a bit by making the players communicate only using hand gestures. Check out our other line-up and transition games and ideas. How to Play: Don’t tell the group what they will be using the M&M’s for. Ask them to grab some from the bowl. How many they have in their hand will be the number of facts they will have to tell. For each blue one they have, they must tell a fact about their family, for each green they must tell a fact about their school and so on until everyone has completed all the facts. When they’re finished they can enjoy eating the M&M’s. What You Will Need: People bingo sheets made of 4×4 or 5×5 grids. Each box should list a personal statement such as: has red hair, has short hair, is wearing a short sleeve shirt, etc. Mix things up on each bingo card. Set Up: Hand out a bingo card, along with a pen, to each participant. How to Play: Every player should walk around the room and find the name of each person to match the personal statement. Only one person can be used per card. So, if Amber has red hair and it’s short, her name can only be used in one of the spaces. The idea is to fill up the card with a different name on each space. The game can be over when the cards are full, or you can ask one person to be the caller at the end who will then call out each name randomly. The players will cross the names off of their cards just like the game bingo until the first person gets four in a row. What You Will Need: A group of mixed aged children ages 4 and older. What You Will Need: Any number of mixed aged children and adults. Set Up: Everyone should sit in a circle facing each other. How to Play: This game is played like the alphabet game, but this time you will be using the first letter of your name. One person will start by saying their name and a food that begins with the same letter as their name. The next person will repeat what the first person says and then add their own. The next person will then repeat the first two in order and then add their own. Play will continue until the last person says each one in order and ends with their own. If you want more of a challenge you can eliminate each person who gets it wrong and the last person to say them all without making a mistake will win the game. Check out our other circle games. What You Will Need: Mixed aged children and a beach ball. Set Up: Everyone should stand in a circle facing each other. One person will start with holding the ball. How to Play: The person holding the ball will say a name of someone in the group and toss the ball to that person. That person must catch the ball without dropping it. He/she will then say the name of another member in the group and toss it to that person. The play will continue with each person receiving and tossing the ball once. If the ball is dropped at any time, the play will start once again from the beginning until each person has a turn and the ball isn’t dropped. You can play until each person has a turn without the worry of dropping the ball to make it easier when there are smaller children involved. 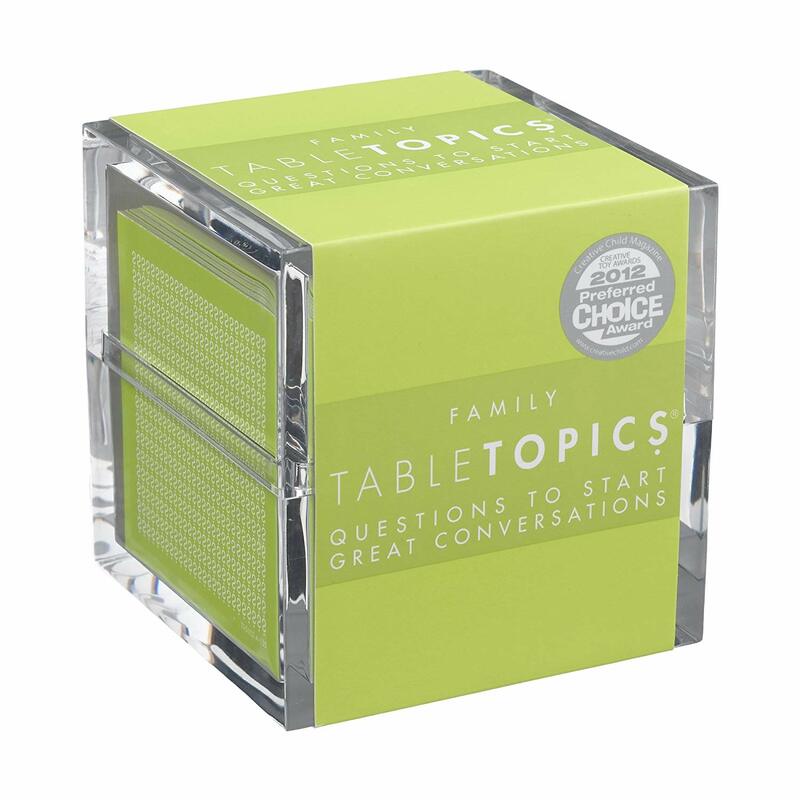 What You Will Need: This game can be purchased from Amazon and it provides a box full of cards with great topics that can be used as conversation starters around the table. Set Up: Everyone can sit on the floor in a circle or around the table. Place the box of cards in the middle for everyone to reach. How to Play: You can play this game in many different ways, but one way you could play is to pass the box around allowing each person to take out a card on their turn and answer the question. You could also deal five cards to each person and take turns around the table answering one question at a time. When the turn is over they can discard and draw a new card so they always have five. You might also consider incorporating these topics into some of the other games on our list. What You Will Need: Various building materials. Set Up: Split the group up into small teams and supply them with the materials they will need to build their creations. How to Play: Each team will be allotted an amount of time to work together in constructing a certain creation with a limited amount of unusual materials. For an example, you might provide each team with a box of spaghetti and a bag of marshmallows and ask them to build the tallest tower. You might want to provide each team with paper and string to make an egg support. Maybe you want them to build a bridge using duct tape and popsicle sticks that will hold a heavy book without breaking. Whatever you choose to do, each team will only have a certain amount of time from the beginning to the end and then they will compete to see which team’s construction holds up the best. What You Will Need: Any size group of mixed aged children and adults. Set Up: Everyone can sit around in a circle, at a table, or on living room furniture. 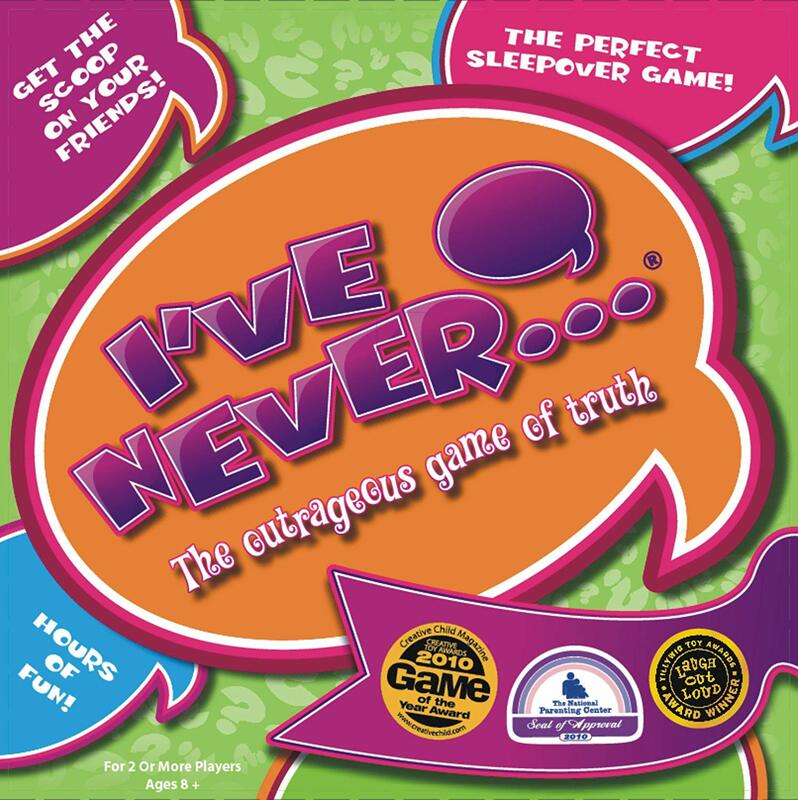 This game can be played anyplace you choose, even around the campfire or on a bus. What You Will Need: A group of mixed aged children and some questions. Set Up: Form the groups into teams or play as individuals. Each person should prepare a set of statements about themselves, possibly 5 different sets. With each set of statements, one should be the truth and the other two should be a lie. How to Play: Take turns going around the room allowing each person to read from a set of statements. A set of statements should be one truth and two lies. Everyone working in teams or as individuals should decide which one of the three is the truth. An example of a set of statements could be: 1) I was born in Canada, 2) I was adopted, 3) I’m an only child. The group would need to decide which of those three is a true statement. The participants can make up silly questions if they want to as long as one is always true. What You Will Need: A large tray for each team, a piece of clothing for each tray, ice, and a pair of heavy gloves for each participant. Set Up: Using a large tray, place a piece of clothing i.e., a tee-shirt, shorts, hat, gloves, socks, etc. Any piece of clothing can be used, but to make it fair, it should be the same kind for each tray. Pour water over the tray and allow it to completely freeze. You will want to use old pieces of clothing that can be thrown away when the game is over. It will also be helpful to wet the clothing before placing it on the tray. How to Play: Have each participant put on gloves and place the frozen trays in front of each team. On the count of three give the teams a lot of space to begin breaking the ice. The teams should race to break the ice and thaw out the clothing. The first team to put on the clothing wins the game. What You Will Need: Purchase this fun card game from Amazon and that’s all you will need. Set Up: Everyone can sit in a comfortable place around the table or in a circle on the floor. Place the two decks close by in front of all the players. How to Play: This game is simple and fun and will be sure to get the room talking and laughing in a matter of minutes. There are two decks of cards, one deck is filled with questions and the other is filled with statements. 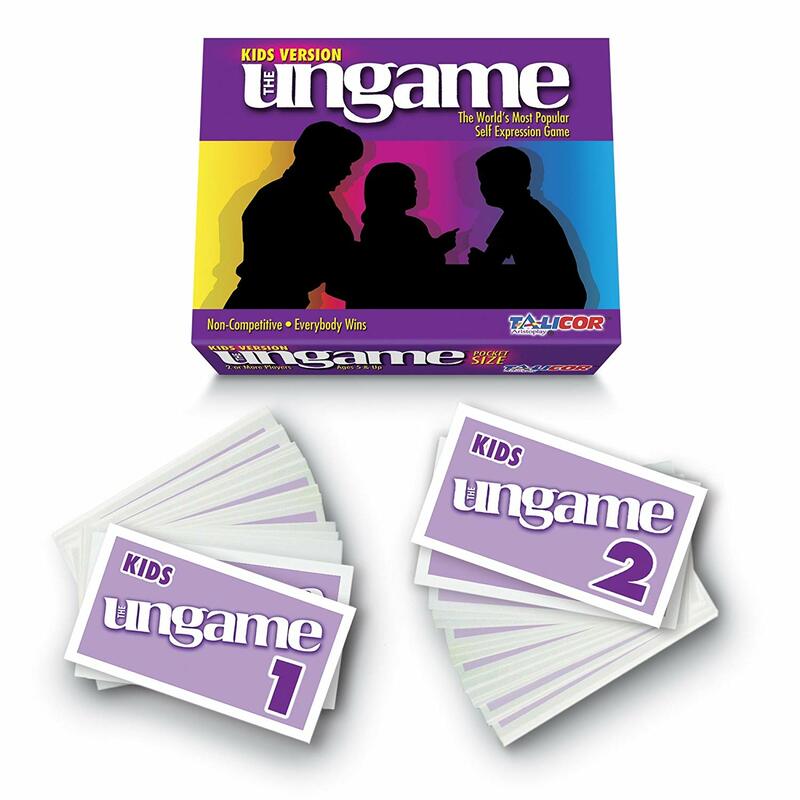 There is an instruction book that comes with the game, but each person will take turns drawing a card and discussing an answer that matches the question or statement on the card. Some of the statements might discuss honesty and bragging, while the questions might be more specific to the individual player. This is another game that you could easily incorporate into some of the other games on our list. What You Will Need: A large area and some chalk or masking tape. Set Up: Make two lines on the ground using the chalk or masking tape. How to Play: In a large area, line up the group on one of the marked lines, or divide them up on the two lines if it is a larger group. This game will give the children the opportunity to make choices while meeting people with their same interests. The adult should call out things such as cat or dog while pointing to one line for cat and the other for the dog. The children must decide which they like better and run to the proper line. You can also call out things like blue or purple? Hot dogs or hamburgers? and so on. 21. Who Stole the Cookies from the Cookie Jar? What You Will Need: A group of mixed aged kids and a plastic cookie jar or container. Set Up: Gather everyone in a group close together. The adult should start by holding the cookie jar. How to Play: The group starts singing “Who stole the cookies from the cookie jar?” The leader states (child’s name) and hands the cookie jar to the person named while everyone chimes in singing “stole the cookies from the cookie jar.” The child holding the cookie jar sings, “Who me?” The others sing, “Yes, you!’ The child with the cookie jar says, “Couldn’t be!” The others then sing, “Then who?” At that time the child holding the cookie jar passes it to another child and the song begins again with that child’s name. The game continues until everyone’s name is used. 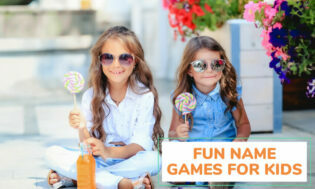 The kids love using the adult’s names too, so be sure and participate in this game. 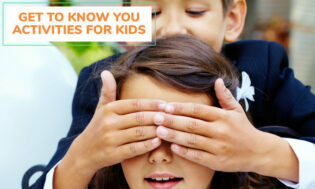 There you have it, 21 fun icebreaker games for kids. Once all the kids are feeling comfortable another good activity would be some improve games and activities for kids.